Happy Thursday! This week our spotlight of the week if floral print! 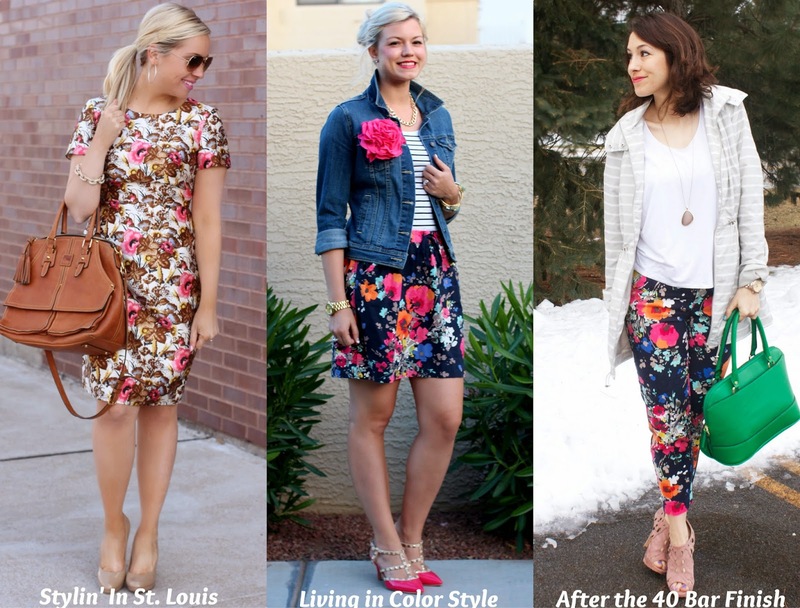 Floral print is so much for to wear! Especially, for spring! I have had this floral dress for a little while and it has not been warn as often as I thought! I love this print, and it just needs to come out more often! Come share you look with Elle and I! 1. We kindly ask that you follow the two hosts: Elle from Living in Color Style and Jacqueline from Stylin' In St. Louis via Bloglovin or GFC, and of course, our co-host, Nina of After the 40 bar finish, blog. Spotlight: Our spotlight this week is Whitley from Simply Whit in a Sequined Life! Whitley's button-up look is so classic and she is rocking this perfect color combination! She really looks amazing! Go check out her darling blog! Nextweek: Next week our spotlight weekly theme is spring blazers! Thanks for linking up! See you next week! That is a great dress and looks perfect on you. The print is so pretty. That dress fits you like a glove....& the floral design is so unique!! I love this brown-based floral- it's so warm and gorgeous! This looks so pretty on you! I had floral print jeans last year but hardly ever wore them. I want to get some that are more of a fun color than more denim... if that makes sense haha! What a pretty dress! I love how you styled it with neutral accessories so the print really stands out! Very colorful and nice dress with perfect length. You have a very nice pictures, would you like to follow each other? Please let us know. 3 beautiful examples of floral. I love the this very feminine trend. love your dress! so chic and so flattering! What a great dress on you. The fit and colors are perfect! That dress is absolutely stunning! You look beautiful! What a gorgeous dress! It's so polished and ladylike. Pretty dress! The pink lipstick works perfectly with it. You look great!! This dress is very nice and pretty on you. And ...I didn't know you had a hop. I'll join. Love this J Crew dress. The floral print is amazing! You look fabulous in that dress! It fits you like a glove! Love the dress! You look gorgeous in it! the print & cut of that dress is classic & gorgeous!